The Rantings Of A Burned Out Canner! Every morning when I come downstairs from a restless nights sleep, I know exactly what is waiting for me, and it’s not a pretty sight. I want a clean stove! Is that really too much to ask for? Can having a clean stove be something I will only dream about or is it something that might actually, possibly, just maybe happen some day in my life before we have to replace it for the third time because I’ve burned yet another one out? Don’t get me wrong, I do clean my stove. Not as often as I should, or probably as often as most people do, but it does get clean. The trouble with cleaning it though is that gosh darn it if it doesn’t just get completely dirty again. And we are not just talking a spill here or a drip there. No, we are talking totally and completely unrecognizably stained, burned and splattered. I don’t think I’m a messy person. I wouldn’t consider myself to be flippant when it comes to cleaning up messes, but my stove is NEVER, and I don’t use that word lightly, clean. Even when it’s clean, it’s not really clean. There is always just a subtle streak, a tiny spot, or because this stove is now several years old those black marks that just won’t come off there to mock me. Is it a curse? Am I the only one who can’t seem to have one day when her stove is clean for more than the ten minutes between meal preparation, canning projects, or kitchen endeavors? Realizing that a clean stove just might be too much to ask, I began to think about all the other things that I want, and the list was HUMONGOUS! I want a kitchen floor that I can walk on barefoot and not have to worry about crunching, sticking, or slipping. I want kitchen cabinets without food drips all down the front of them. I want empty counter space. Yep, either the counters are filled with full canning jars, empty canning jars, stacks of dishes to be cleaned, pots and pans to be scoured, or food to be processed. I want a kitchen table without crumbs all over it because no one thought to shake out the tablecloth after the last five dinners I made. I want a kitchen sink that isn’t already full of dishes soaking or stacked so high you can’t even use the faucet. I want coffee and end tables that aren’t covered and stacked with recipes, note books full of notes on future blog posts, gardening books, and all sorts of papers strewn on every table and taking up every cushion on the couch. I want to know what color my carpeting is. I think we have navy blue, but for all the dust, lint, dog toys and hair, and other paraphernalia all over it I just can’t be sure. Doesn’t anyone around here know what a vacuum is – oh yeah, that’s my job. Okay then, I want my carpet vacuumed. I want to know what watching television without a ½ inch of dust on it is like. I want to know who keeps putting all those cobwebs in every corner and in every crevice imaginable. I want the stack of ironing sitting on the fireplace to magically be done and all the baskets of unfolded laundry folded and put away. I want the sheets on every bed to get a washing that is too long overdue. I want all the work that needs to be done in Zeb’s room behind me: The border on his ceiling needs removing, the walls need to be primed and repainted (including the ceiling and closet), his videos, trophies, and anything on his dressers or bookshelves need to be boxed so we can throw out his old “little boy” furniture to make way for his new bedroom set being delivered in a couple of weeks, we need to remove the old carpet and put in the new, and I need to find new bedding, make a new window treatment, and all the finishing touches a remodeled room requires. I want it done before he turns 22, which is in a few months, but in reality I have less than a month to get all the prep work done before the furniture arrives. I want to wash my windows. Yes, you read that correctly. I WANT to wash my windows. I hate washing windows but at this point the prospect of washing them appeals to me. I basically only streak them, but I want clean windows so I’m willing to streak them as only I can and clean the tracks too! Of course the reason I want to clean windows now, when it isn’t really a priority, is probably because there is no way in the world I’m going to do it. When I actually have the time for such a project, I will hate every minute of it, but if I went upstairs right now and started cleaning any window, I think I’d find some sort of distorted comfort in it. I want a fresh cup of coffee. I have been drinking out of the same pot of coffee, just reheating it, for the past three days now. A fresh cup of coffee sounds so good right now, but a luxury that cannot be – BECAUSE I’D NEED A CLEAN SPOT ON THE COUNTER IN ORDER TO MAKE IT! I want all the shoes that everyone just tosses off and leaves in the entrance to the laundry room put away where they belong. Let me qualify that by saying “put away by the people who tossed them there” and not by me! I want someone to walk Bell. Although it does give me a reprieve from everything overwhelming me here in the house, it would sure be nice to have someone else take her for a change. I want dinner done. No matter what I do all day long, dinner is the one thing that absolutely, positively, without fail has to get done TOO! Not in leu of, but along with. How nice it would be to actually spend a day just making dinner and not have to worry about everything else on my perpetual to do list. I want the gardens to be cleaned out. The cucumbers and peas are done and need to be cleared to make way for spring crops and there are several gardens that need revamping for next year as well. I want all the peppers and tomatoes waiting to be harvested picked and processed, the pumpkins pureed and frozen and the corn dried. Actually at this point I just want the peppers and tomatoes to STOP. The peppers especially seeing as I can’t figure out anything to do with them and there are at least a few hundred more peppers out there to pick. Is all this really too much to ask? Oh, and I want a stocked, full pantry. Wait. I forgot…the pantry. Yes, this is stocked and overflowing. A testament of where my time has gone, what I’ve been doing, and why everything else in our house seems to be in complete upheaval and an utter disaster. So is this the price I have to pay for a full pantry? Still, what I wouldn’t do for a fresh cup of coffee right about now, and with that I’ll sign off – Simply Grateful. Growing up I was lived in a home where my father was the only person who barbecued. Mom was in charge of cooking in the kitchen, but whenever it came to grilling anything from hot dogs to prime rib roast, Dad was in charge. The line of “men” being in charge at the grill wasn’t something that started with my father. His father and my mother’s father were also the Grill Masters at their homes and whenever we went to any family reunions on either side of the family, men were always the ones who hung around the barbecue pit, drinking beer, sneaking tastes, and chasing away any woman who came within ten feet of the hot coals. For 20+ years I was comfortable with this barbecue hierarchy and never questioned it. Then I moved out on my own and started dating my now husband, Hubby. While living on my own I never invested in a grill, but Hubby bought me a little hibachi for my balcony so we could grill steaks, burgers, or just about anything we wanted. While we dated, Hubby took care of the grilling. I don’t think it was because he wanted to do the grilling, but more because of my ignorance when it came to cooking anything anywhere other than the stove. After we got married and I began accompanying Hubby to barbecues at his parent’s house however, it became immediately clear that things were very different in his family when it came to the “Rules of the Grill.” There were no men gathered around the grill, no beer drinking and comradery going on by the coals, and no taste testing hot off the grate. Nope, just my mother-in-law standing over the grill, sweating, cussing, and completely alienated from everyone else. Until the food was put on the table for everyone to enjoy, it was as if the grill and my mother-in-law didn’t exist. Owning a barbecue for Hubby and I didn’t come until a few years after we got married, but when we did get one, I held my ground when it came to grilling. I took care of the food preparation inside the house, and Hubby was to be in charge of the grilling. I never gave it much thought because he’d done it while we dated on our little hibachi at my apartment, but after we were married, his attitude changed. At one point he even pointed out to me that “His Father” didn’t have to grill — that “His Mother” did all the food prep including the grilling. Being the so understanding and ever patient wife that I was back then (NOT), I quickly pointed out that he didn’t live in Oz anymore and here in the real world if he wanted to have a barbecue, he was going to have to do the grilling. At first he protested by burning practically everything he put on the grill, but I held my ground. A battle of wills that I knew was not going to end well…or at least with me being the victor. Finally after many arguments and too many ruined meals, grilling became a thing of the past. Dinners were planned rather than barbecues and Hubby won. Or so he thought. Summer is the time for grilling, but even in the dead of winter, a burger is just not a burger unless it’s cooked slowly over the hot grates of a grill. Hubby may have won the battle, but I was looking long-term and waging to win the war. After a year or so of no grilling, Hubby began suggesting we grill on occasion. There was no argument, he just went to the grill, lit it up, and grilled. 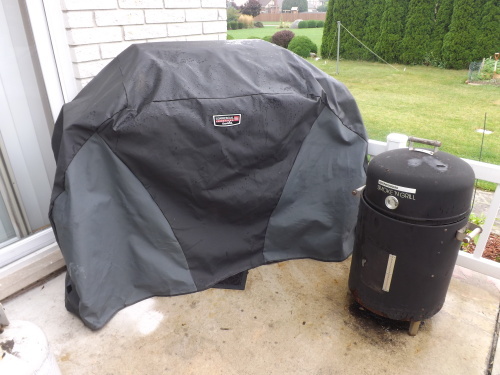 Then, because of the lack of tension between us, I also became far less averse to pitching in and grilling if I happened to plan a meal that included grilling during the week when he was working. I’d light the grill and get the meal almost done in time for his arrival and then he’d finish up while I put everything I’d made in the kitchen on the table. As with most things I attempt to do, taking on this new Grill Master role is not taken lightly. Now I am struggling to truly earn that title. At this point I’d have to say I am just barely scraping by, but I continue to work at it. One thing I have learned though is that success in this role has a lot to do with the tools you have to work with. Not just the grill itself or the utensils used, but also the selection of meats as well as the sauces used. That being said, this year I have been experimenting with various recipes for homemade barbecue sauce. The one I made last year Sizzlin’ Plum Barbecue Sauce didn’t quite turn out how I’d wanted, so this year I tweaked the recipe to make it better (check out my post today on Simply Grateful Canning for the updated version Plum Barbecue Sauce Update). I’m also going to have posts on a few other sauces I’m working on, so keep a lookout. Marriage can be a battle of wills, but realizing that compromise will serve your relationship better, is what holds you together, and for this I am — Simply Grateful. Trying to keep my head above water with all the summer harvesting and the overwhelming amount of canning that goes with it, has been especially challenging this year. To break up the monotony of canning practically every waking moment, I took a day to have a barbecue with some family. Barbecues take little planning, so most of my effort went into the dessert. 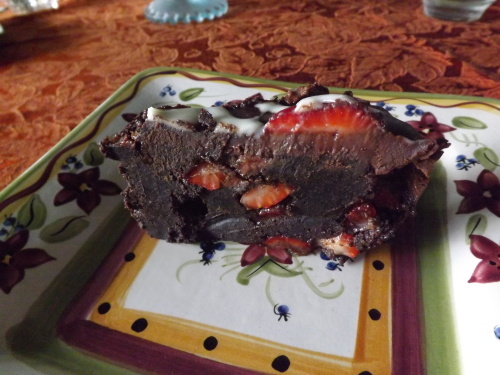 The Strawberry Truffle Cake I made (recipe can be found on the link to Simply Grateful Cooking that was posted today) was the perfect ending for a summer barbecue. The fact that this dessert has chocolate cake, strawberries, and a chocolate topping, well that just made it even better. When isn’t chocolate appropriate for dessert — or breakfast, or dinner, or lunch, or snacking? Is there really anytime that chocolate isn’t appropriate? If there is, don’t tell me, I don’t want to know. Getting back into more cooking than just the day-in day-out making dinner, getting it over with, was really a treat. Making a dessert that was “TO DIE FOR” didn’t hurt either, and for this I am — Simply Grateful. The past couple of weeks have left me little time for much else other than canning and cooking. It seems that everything is ready for harvesting and every day there are more and more canning projects added to my ever-growing to do list. Our plum tree has blessed us with over 120 pounds of usable fruit this year and I have completed canning more than 100 pounds of it. The remaining was given to friends and family other than the 12 pounds left on my kitchen counter and just a few left in the tree for picking. I can finally see the light at the end of the tunnel. Today I finished my second batch of plum pulp and have ten quarts and one pint for the pantry shelves. 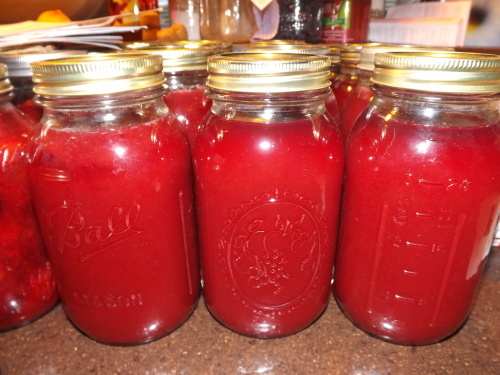 Check out my post at Simply Grateful Canning Preserving Plum Pulp For Future Projects. 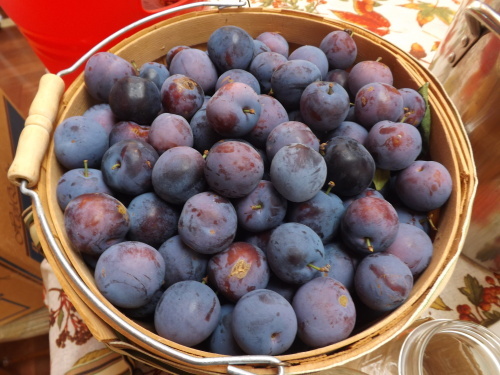 There will be many other plum recipes for canning to follow. 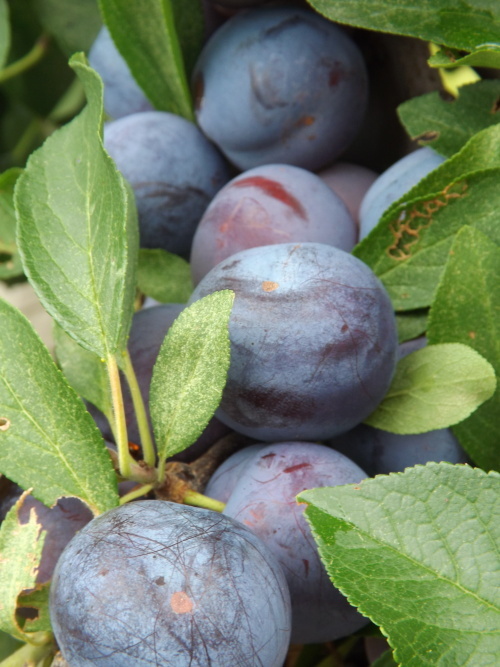 With plum season finally coming to a close, I can concentrate on other pressing crops like tomatoes, peppers, corn, peaches, beans and potatoes, and for this I am — Simply Grateful. 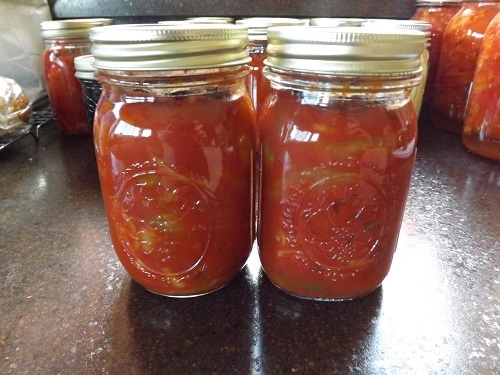 Today I posted a recipe for Satarasch, a Serbian side dish/condiment consisting of peppers, onions, and tomato sauce on Simply Grateful Canning. This is a staple at nearly every Serbian picnic we go to every summer and now I’ve canned it for the pantry shelves, and for this I am — Simply Grateful. 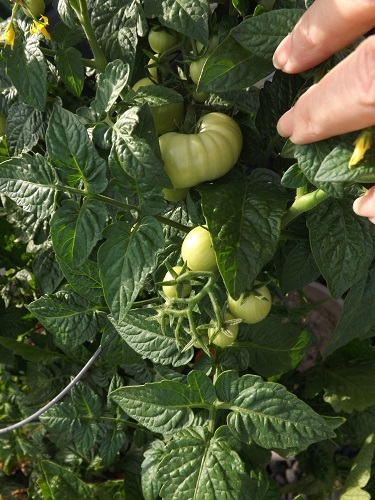 Beef Steak tomato on cherry tomato plant. It truly surprises me all the spectacular things that happen in nature, and for this I am — Simply Grateful. 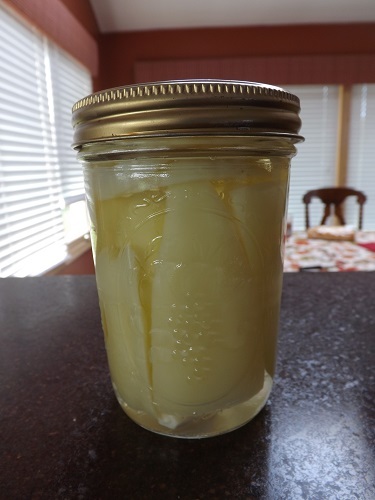 This afternoon on Simply Grateful Canning I made a post on how to pickle peppers. I have been picking peppers nearly every other day. So far this summer I have picked 167 peppers from the 35 plants in the gardens and there are lots more peppers and flowers on the plants. My goal was to harvest enough peppers to can enough pickled peppers for an entire year – 24 pints. I met this quota before I even picked the last 60 peppers. What a thrill! Check out my post Pickling Peppers and keep an eye open for more pepper posts to follow. My pickled pepper quota has been met for 2015 and for this I am — Simply Grateful.